Table B4 on page 75 of the supplementary report sets out a summary of submitting authors by unit of assessment, gender and whether or not they were an early career researcher (ECR)**. 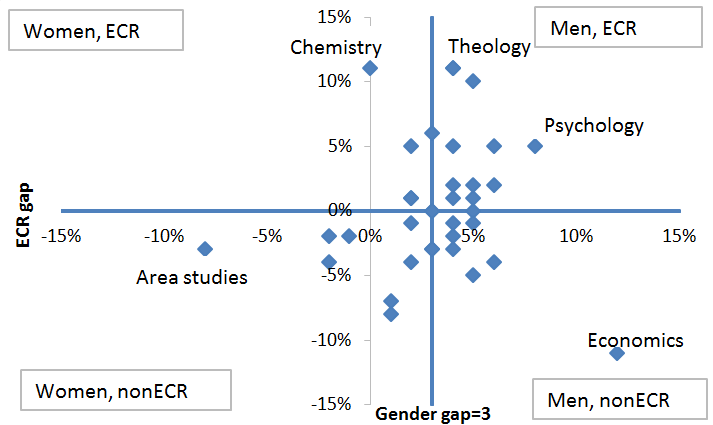 We then used this summary to produce a table and scatterplot that shows the gender and ECR gaps in achieving 4* research (see Table 1 & Figure 1; a positive percentage indicates that more men/ECRs achieved 4* research than women/non-ECRs). Economics & Econometrics perhaps catches the eye the most. 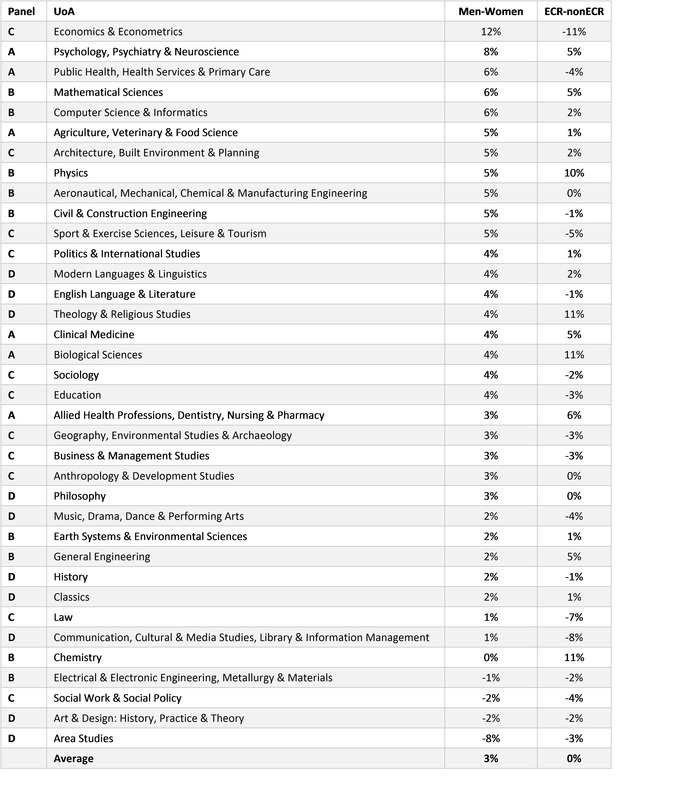 It is the only UoA in which the gap between men and women is greater than ten percentage points (and, in the regression summarised in Table B5 on page 77, seemingly a direct association with gender). It is also one of only five in which the gap between ECR and non-ECR is greater than ten percentage points and the only one in which this gap is in the favour of non-ECRs. So, if you want to be the best at economics and econometrics (or at least the best at economics and econometrics according to a flawed and expensively bureaucratic review process), being an older man seems to provide you with a pretty good head start. Also worthy – if that’s the right word – of mention are Psychology, Psychiatry & Neuroscience; Architecture, Built Environment & Planning; and Computer Science & Informatics. As shown in Table B5 of the supplementary report, the difference in gender gap with these three UoA all also appear to have a direct association with gender. What of our own disciplines? Political Science is close to the average for both; the gender gap is 4 percentage points and the ECR gap one percentage point. The regression in Table B5 suggests that the fact that male political scientists are more likely to achieve 4* research than their female counterparts is accounted for by the citation characteristics of the papers rather than gender itself. However, we may consider this a slightly disingenuous conclusion if citation patterns are themselves gendered (although also see this little gem and also L.J. Zigerell’s response to Malniak et al.’s paper). For Social Work & Social Policy, women are slightly more likely to achieve 4* outputs compared to their male counterparts (19% compared to 17%) and ECRs are less likely to achieve the highest ranking (14% compared to 18% of non-ECRs). There were no subjects where women outperformed men and ECRs outperformed non-ECRs, although chemistry had no gender gap and a big plus for ECRs. With women probably more likely to be ECRs in most subjects, it is certainly worth looking at both these gaps. All in all, lots to think about. UPDATE (16-7-15): The link to L.J. Zigerell’s response was included after it was brought to our attention. ** Non-ECRs had to submit four pieces of work to the REF (unless they had special circumstances like a past illness or parental leave, or if part-time); ECRs could submit fewer. Reblogged this on Gender Politics at Edinburgh.